Description: The historical Ezra was sent to Jerusalem as an emissary of the Persian monarch. What was his task? According to the Bible, the Persian king sent Ezra to bring the Torah, the five books of the Laws of Moses, to the Jews. Modern scholars have claimed not only that Ezra brought the Torah to Jerusalem, but that he actually wrote it, and in so doing Ezra created Judaism. Without Ezra, they say, Judaism would not exist. 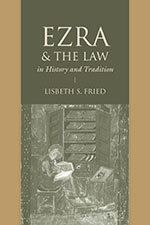 In Ezra and the Law in History and Tradition, Lisbeth S. Fried separates historical fact from biblical legend. Drawing on inscriptions from the Achaemenid Empire, she presents the historical Ezra in the context of authentic Persian administrative practices and concludes that Ezra, the Persian official, neither wrote nor edited the Torah, nor would he even have known it. The origin of Judaism, so often associated with Ezra by modern scholars, must be sought elsewhere. After discussing the historical Ezra, Fried examines ancient, medieval, and modern views of him, explaining how each originated, and why. She relates the stories told about Ezra by medieval Christians to explain why their Greek Old Testament differs from the Hebrew Bible, as well as the explanations offered by medieval Samaritans concerning how their Samaritan Bible varies from the one the Jews use. Church Fathers as well as medieval Samaritan writers explained the differences by claiming that Ezra falsified the Bible when he rewrote it, so that in effect, it is not the book that Moses wrote but something else. Moslem scholars also maintain that Ezra falsified the Old Testament, since Mohammed, the last judgment, and Heaven and Hell are revealed in it. In contrast Jewish Talmudic writers viewed Ezra both as a second Moses and as the prophet Malachi. In the process of describing ancient, medieval, and modern views of Ezra, Fried brings out various understandings of God, God's law, and God's plan for our salvation. Citation: Thomas Hieke, review of Lisbeth S. Fried, Ezra and the Law in History and Tradition, Review of Biblical Literature [http://www.bookreviews.org] (2015).